For other uses, see Wasabi (disambiguation). Wasabi (Japanese ワサビ, わさび or 山葵; Eutrema japonicum or Wasabia japonica) or Japanese horseradish is a plant of the Brassicaceae family, which also includes horseradish and mustard in other genera. A paste made from its ground rhizomes is used as a pungent condiment for sushi and other foods. It is similar in taste to hot mustard or horseradish rather than chili peppers in that it stimulates the nose more than the tongue. The plant grows naturally along stream beds in mountain river valleys in Japan. The two main cultivars in the marketplace are E. japonicum ‘Daruma’ and ‘Mazuma’, but there are many others. The oldest record of wasabi as a food dates to the 8th century CE. The popularity of wasabi in English-speaking countries has tracked that of sushi, growing steadily starting in about 1980. Due to issues that limit the Japanese Wasabi plant’s mass cultivation and thus increase its price and decrease availability, outside of Japan the Western Horseradish plant is generally used in place of the Japanese Horseradish. This version is commonly referred to as “Western Wasabi” in Japan. Wasabi is generally sold either as a rhizome or stem, which must be very finely grated before use, as dried powder, or as a ready-to-use paste in tubes similar to toothpaste tubes. The part used for wasabi paste is variously characterized as a rhizome, a stem, or the “rhizome plus the base part of the stem”. Legumes (peanuts, soybeans, or peas) may be roasted or fried, then coated with wasabi powder mixed with sugar, salt, or oil and eaten as a crunchy snack. In Japan, it’s called ‘wasabi-mame’. ‘mame’ means bean. The evaluation of the color and the taste of grated wasabi. From the left, Hikimi wasabi (Daijin species), Hikimi wasabi (native species) and Wasabi from Shizuoka Prefecture (Mazuma species). Wasabi favours growing conditions that restrict its wide cultivation (among other things, it is quite intolerant of direct sunlight, requires an air temperature between 8°C (46°F) and 20 °C (70°F), and prefers high humidity in summer). This makes it impossible for growers to fully satisfy commercial demand, which makes wasabi quite expensive. Therefore, outside Japan, it is rare to find real wasabi plants. Due to its high cost, a common substitute is a mixture of horseradish, mustard, starch, and green food coloring or spinach powder. Often packages are labeled as wasabi while the ingredients do not actually include any part of the wasabi plant. The primary difference between the two is color, with Wasabi being naturally green. 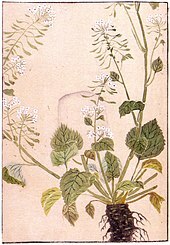 In Japan, horseradish is referred to as seiyō wasabi (西洋わさび, “western wasabi”). In the United States, true wasabi is generally found only at specialty grocers and high-end restaurants. The chemical in wasabi that provides for its initial pungency is the volatile allyl isothiocyanate, which is produced by hydrolysis of natural thioglucosides (conjugates of the sugar glucose, and sulfur-containing organic compounds); the hydrolysis reaction is catalyzed by myrosinase and occurs when the enzyme is released on cell rupture caused by maceration – e.g., grating – of the plant. The same compound is responsible for the pungency of horseradish and mustard. Allyl isothiocyanate can also be released when the wasabi plants have been damaged, because it is being used as a defense mechanism. Research has shown that such isothiocyanates inhibit microbe growth, perhaps with implications for preserving food against spoilage and suppressing oral bacterial growth. Because the burning sensations of wasabi are not oil-based, they are short-lived compared to the effects of capsaicin in chili peppers, and are washed away with more food or liquid. The sensation is felt primarily in the nasal passage and can be quite painful depending on the amount consumed. Inhaling or sniffing wasabi vapor has an effect like smelling salts, a property exploited by researchers attempting to create a smoke alarm for the deaf. One deaf subject participating in a test of the prototype awoke within 10 seconds of wasabi vapor sprayed into his sleeping chamber. The 2011 Ig Nobel Prize in Chemistry was awarded to the researchers for determining the ideal density of airborne wasabi to wake people in the event of an emergency. Wasabi is normally consumed in such small quantities that its nutritional value is negligible. The major constituents of raw wasabi root are carbohydrates (46%), water (32%), and fat (11%). Nagano Prefecture including the Daio Wasabi Farm in Azumino; a popular tourist attraction and the world’s largest commercial wasabi farm. There are also numerous artificial cultivation facilities as far north as Hokkaido and as far south as Kyushu. As the demand for real wasabi is very high, Japan imports an amount from Taiwan, Korea, Israel, Thailand and New Zealand. In North America, a handful of companies and small farmers cultivate Wasabia japonica. In Europe wasabi is grown commercially in Iceland and the UK. ^ “Eutrema japonicum (Miq.) Koidz”. The Plant List. Retrieved 9 August 2016. ^ “Wasabia japonica”. Multilingual Multiscript Plant Name Database, University of Melbourne. Retrieved 9 August 2016. ^ Morgan, Lynette (2005). “Hydroponic Production of Wasabi & Japanese Vegetables”. In Weller, Thomas; Peckenpaugh, Douglas. The Best Of Growing Edge International, 2000–2005. New Moon Publishing. p. 57. ISBN 978-0-944557-05-1. Retrieved 9 August 2016. ^ わさびの歴史. Kinjirushi. 2001. Archived from the original on 18 April 2001. Retrieved 9 August 2016. ^ “Definition of rhizome – Merriam-Webster’s Student Dictionary”. wordcentral.com. ^ Lowry, Dave (2005). The Connoisseur’s Guide to Sushi: Everything You Need to Know about Sushi. The Harvard Common Press. p. 205. ISBN 978-1-55832-307-0. Retrieved 9 August 2016. ^ Sultana, Tamanna; Savage, Geoffrey P; McNeil, David L; Porter, Noel G; Martin, Richard J; Deo, Bas (October 2002). “Effects of fertilisation on the allyl isothiocyanate profile of above-ground tissues of New Zealand-grown wasabi”. Journal of the Science of Food and Agriculture. 82 (13): 1477–1482. doi:10.1002/jsfa.1218. (Subscription required (help)). ^ Cordwell, Simon (6 April 2010). “One chefs return home and adventures rediscovering the culinary delights of Tasmania”. Tassie Chef. Retrieved 9 August 2016. ^ “Preparing, Using and Storing Fresh Wasabi”. Shima Wasabi. Retrieved 9 August 2016. ^ Lim, Tong Kwee (2014). “Eutrema japonicum: Edible Plant Parts and Uses”. Edible Medicinal and Non-Medicinal Plants: Volume 9, Modified Stems, Roots, Bulbs. p. 790. ISBN 978-94-017-9511-1. ^ a b Arnaud, Celia Henry (22 March 2010). “What’s wasabi, and is your fiery buzz legit?”. Chemical & Engineering News. Vol. 88 no. 12. American Chemical Society. p. 48. ISSN 0009-2347. Retrieved 9 August 2016. ^ “Wasabi is quite picky about its growing conditions”. Real Wasabi. Cullowhee, NC: Real Wasabi, LLC. Retrieved 25 October 2016. ^ Palmer, J. (1990). “Germination and growth of wasabi (Wasabia japonica (Miq.) Matsumara)”. New Zealand Journal of Crop and Horticultural Science/Experimental Agriculture. 18 (2–3): 161–164. Retrieved 25 October 2016. ^ Gittleson, Kim (18 September 2014). “Wasabi: Why invest in ‘the hardest plant to grow’?”. BBC News. Archived from the original on 19 September 2014. Retrieved 25 October 2016. ^ Ferdman, Roberto A. (15 October 2014). “The wasabi sushi restaurants serve is pretty much never actual wasabi”. Washington Post. Retrieved January 17, 2018. ^ Gazzaniga, Donald A.; Gazzaniga, Maureen A. (2007). “Glossary”. The No-Salt, Lowest-Sodium International Cookbook. Macmillan. p. 301. ISBN 978-1-4668-1915-3. Retrieved 9 August 2016. ^ “Sushi Items – Wasabi”. The Sushi FAQ. Archived from the original on 6 August 2011. Retrieved 9 August 2016. ^ Skidmore, Sarah (1 March 2007). “Condiments – Wasabi: real vs. fake”. Effingham Daily News. Effingham, IL. Archived from the original on 2012-07-21. ^ a b Kazuo Ina; Hiroji Ina; Mikako Ueda; Akihito Yagi; Isao Kishima (1989). “ω-Methylthioalkyl Isothiocyanates in Wasabi”. Agricultural and Biological Chemistry. 53 (2): 537–538. doi:10.1271/bbb1961.53.537. Retrieved 9 August 2016. ^ a b Hideki Masuda; Yasuhiro Harada; Kunio Tanaka; Masahiro Nakajima; Hideki Tabeta (1996). “Characteristic Odorants of Wasabi (Wasabia japonica matum), Japanese Horseradish, in Comparison with Those of Horseradish (Armoracia rusticana)”. Biotechnology for Improved Foods and Flavors. ACS Symposium Series. 637. American Chemical Society. pp. 67–78. doi:10.1021/bk-1996-0637.ch006. ISBN 9780841234215. ^ “Condiments – Wasabi: real vs. fake”. Archived from the original on 11 July 2011. Retrieved 9 August 2016. ^ Atsumi, A; Saito, T (2015). “Volatiles from wasabi inhibit entomopathogenic fungi: implications for tritrophic interactions and biological control”. Journal of Plant Interactions. 10 (1): 152–157. doi:10.1080/17429145.2015.1039613. ISSN 1742-9145. ^ Zeuthen, P.; Bøgh-Sørensen, Leif (2003). Food preservation techniques. Woodhead Publishing Limited. p. 12. ISBN 978-1-85573-530-9. Retrieved 9 August 2016. ^ Levenstein, Steve. “Wasabi Silent Fire Alarm Alerts the Deaf with the Power of Scent”. InvestorSpot. Retrieved 9 August 2016. ^ “Winners of the Ig® Nobel Prize: 2011”. Improbable Research. Retrieved 22 March 2019. ^ “Basic Report: 11990, Wasabi, root, raw”. National Nutrient Database for Standard Reference Legacy Release. United States Department of Agriculture, Agricultural Research Service. April 2018. ^ “(title in Japanese)” [Wasabi (Production)] (xls) (in Japanese). Portal Site of Official Statistics of Japan. Retrieved 10 August 2016. ^ Gedye, Lynsey; Mellaerts, Michel Van (10 August 2014). “A Wasabi Growers Story – updated”. World of Wasabi. Archived from the original on 29 July 2018. Retrieved 30 June 2017. ^ Kim Gittleson (18 September 2014). “Wasabi: Why invest in ‘the hardest plant to grow’?”. BBC News. Retrieved 9 August 2016. ^ “Sustainably”. Nordic Wasabi. Jurt Hydroponics. Retrieved 22 March 2019. ^ Leendertz, Lia (21 May 2015). “The UK farm secretly growing wasabi, the world’s most costly veg”. Th Telegraph. Telegraph Media Group. ^ Andoh, Elizabeth; Beisch, Leigh (2005). Washoku: Recipes From The Japanese Home Kitchen. Ten Speed Press. p. 71. ISBN 978-1-58008-519-9. Retrieved 9 August 2016. Il Shik Shin; Hideki Masuda; Kinae Naohide (August 2004). “Bactericidal activity of wasabi (Wasabia japonica) against Helicobacter pylori“. International Journal of Food Microbiology. 94 (3): 255–61. doi:10.1016/S0168-1605(03)00297-6. PMID 15246236. Miles, Carol; Chadwick, Catherine (1 May 2008). Growing Wasabi in the Pacific Northwest. Washington State University Extension. PNW605. Douglas, James A. (1993). “New Crop Development in New Zealand”. In Janick, Jules; Simon, James E. New crops. Second National Symposium, New Crops: Exploration, Research, and Commercialization. Purdue University, Center for New Crops & Plant Products. Wasabi. ISBN 0-471-59374-5. OCLC 468737540. “Wasabi (Wasabia japonica (Miq.) Matsum.)”. Gernot Katzer’s Spice Pages. 11 February 2007. “Wasabi: Japanese flavor—Part 1: Seeking ‘Japan’s No.1‘“. The Asahi Shimbun. 29 December 2016. “Wasabi: Japanese flavor—Part 2: Exceed Real Ones”. The Asahi Shimbun. 9 August 2017.